The Concerned Zongo Youth Association in the Ashanti Region, is calling for the release and speedy implementation of a report by the independent committee set up by government to investigate the killing of seven young men in Asawase. Sadick Alhaji Hussein, Secretary of the Concerned Zongo Youth, is of the view that making the report public, will dispel all kinds of rumors and perceptions about the killings. Sadick Alhaji Hussein in an interview with Citi News, noted that the findings of the Committee, will vindicate the Zongo communities in the region as well as the slain youth. He explained that media reports of confusion in some Zongo communities in the region, is as a result of the delay in the release of the committee’s findings. “What can cure the confusion is that the report should be out. For us even by next week Monday, if the report is out, we want to believe that it is going to help us,” he explained. Former Information Minister, Mustapha Abdul Hamid, reassured residents of Asawase of government’s commitment to unraveling the truth in the shooting incident. He said whoever is found culpable after the committee’s work will not be spared. “…the committee will do a thorough job and ensure that nothing is covered up. Whoever is culpable, blamable, it will be laid squarely and bare,” he said in a Citi News interview. 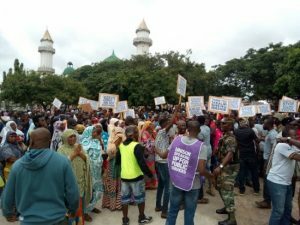 In July this year, hundreds of youth from the Zongo community trooped to Kumasi Central Mosque to register their displeasure over the killings of 7 Zongo youths. The Police in a media briefing on the death of the youth said the 7 were because they were armed robbers who exchanged fire with them. However, relatives and friends of the seven accused the police of planting guns to frame the deceased persons after they had been gruesomely killed. They insist the seven men were not robbers, and yet were painfully killed. The Zongo community in Kumasi has in the past had cause to complain over perceived stereotyping that has led to the killing of multiple Zongo youth over the past few months. The leadership of the Zongo community in the Ashanti Region have vowed to rise against these killings. The post Zongo youth group demands report on Asawase police killings appeared first on Citi Newsroom.